The event: Celebrity performers, advocates and citizens gathered Sunday for the Climate Rally with two goals: to celebrate Earth Day's 40th anniversary and to demand that Congress pass a climate and clean energy bill in 2010. The musical lineup included Sting, John Legend, The Roots, Passion Pit and more. The crowd: Men, women and children of all ages. Sign-carrying activists walked among tourists heading to the Smithsonian. A tight throng filled the area near the stage while others sat on blankets, threw Frisbees, Hula Hooped and walked dogs throughout the Mall. The stage setup: Speakers and musical acts took turns onstage with the Capitol as a backdrop. Large screens flanked the stage with other screens set up for those situated further down the Mall. A cuddly message: While spreading the word about global warming, Geneva Boyer, 18, of Newton, Mass., was melting inside her polar bear costume. She was accompanied by another representative of the Global Warming Education Network, Susan Shamel, 60, who was dressed as a smokestack. They've been posing for photo-ops with curious onlookers since arriving in D.C. for Earth Day last week. "It's so hot, but it's so fun," Boyer says of her costume, which includes a large inflatable globe. "People who might never get excited about environmental activism are so excited to see a fuzzy polar bear." Happy anniversary: Wearing a cape and streamers, D.C. native John Sherman recalled the first Earth Day, which he attended in 1970 as a teenager. He remembers displays about recycling, hippies, Vietnam War-era activism and a lot of energy. "There's a lot of energy here, too," he says. "It's a whole new generation. We've come a long way, but there's so much more to do." Out of this world: As Honor Society wrapped up its afternoon set, two figures stood out from (and above) the crowd -- Elizabeth Kesnick and the mono-monikered experimental artist Flynn, both of New York, who came dressed head to toe as Na'vi from the movie Avatar. The duo wore full-body blue paint, pointed teeth, outfits that looked straight from the planet Pandora and even stilts. Despite the stilts, Kesnick danced gracefully to the music, while onlookers crowded around the pair for pictures. "The Na'vi are all about connectedness," she says. "To nature, to the earth and each other." Passion for Passion Pit: Younger rally-goers rushed from their picnic blankets when the electronic band took the stage. The crowd singing along to the chorus of Little Secrets could be heard from as far as the Washington Monument. Green space: A lush, plant-filled tent served as a replica of Avatar's Pandora, where staffers touted James Cameron's initiative to plant a million trees worldwide and reported that the director had been popping in throughout the day. Over at AT&T's booth, free phone-charging stations were powered by solar panels and a wind turbine activated by winds over 8 mph. Villain really the good guy: Giovanni Ribisi may have played the villain in Avatar, bent on destroying the sacred tree of the Na'vi in his quest for unobtanium, but his own views are more balanced. "So often, there's a polarity between the economy and the environment, and you have to choose sides," he says in the media tent. "And I don't think that is the case." Protecting this planet, he says, is a group effort. "If everyone does a little bit, it's a lot more than one person holding the torch by themselves." Ready for the finale: At 4:30, a tweet on the rally's displayed Twitter feed read: "where are sting and john legend?" Working together: Joss Stone joined The Roots for a jam, wearing a teal shirt saying "Peace is in Fashion." The crowd fist-pumped and jumped in unison, some audience members blowing bubbles. After a brief break, The Roots returned as a backup band, first for gospel singer Mavis Staples, and then for Patrick Stump of Fall Out Boy. Camera time: Stone returned with The Roots for a funky cover of Gnarls Barkley's Crazy. The cameras panned to the crowd to focus on a woman holding a sign reading "Green is the Future." A handwritten poster popped up in front of it reading "We're Here to be Trendy." Sharing the mike: Next up with The Roots was Bob Weir of The Dead, who sang Dancing In the Streets. Stump joined him on vocals for Bill Withers' Harlem. A message from the president: The crowd cheered as President Obama appeared onscreen for a taped address to rally attendees. He called for those in attendance to help "heal the scars our parents and grandparents knew too well." As his speech came to a close, the audience held up peace signs. A message from James Cameron: The director was thrilled to take the stage after Robert Randolph's performance of Purple Haze and to see "a lot of young people rocking out to it." The song, he told the crowd, came out when he was 15, the same year as the first Earth Day. "There is a direct line from that moment in 1970 and making Avatar," he said. Wake-up call: John Legend, backed up by The Roots, got the crowd dancing with Wake Up Everybody, a song off Legend's new collaboration album with the band. The camera revealed Jesse Jackson jamming along backstage. Getting the ball rolling: During Legend's performance of Compared to What, the audience began tossing a giant rubber ball covered with 1,000 plastic bags toward the stage. The ball created by advocacy group Blue Avocado represents the number of plastic bags used by a family in a year. By the song's end, security had rolled the ball off to the side of the stage. Fragile earth: Introduced by his wife Trudie Styler, co-founder of the Rainforest Foundation, Sting took the stage wearing a gray graphic T-shirt with the words "Give Hope" and an image of Africa. Sitting on a stool with his guitar, he opened with his song Fragile. 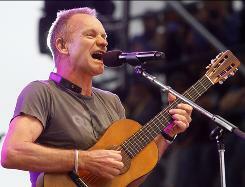 Afterward, Sting greeted his audience and joked, "It's nice to be at a tea party -- a green tea party." Rain dance: As gray clouds moved in over the stage, Sting switched to an uptempo number, One World (Not Three). Then he nonchalantly introduced his closing number with a swig from his water bottle. "I'm going to play a song called Message In a Bottle," he said to cheers.